We were recently given the new Skylanders Trap Team game to play. This is the fourth year there’s been a Skylanders game, and our third review of it. 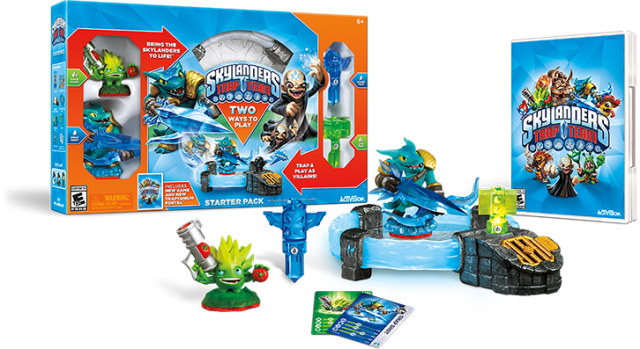 Here’s the first Skylanders game review and Skylander Giants. Trap Team brings a whole new element to the game, and a new portal. That’s three different portals we’ve got now. The first two games used the same portal. We have a separate box just for all the Skylander bits and pieces. This new one’s a bit different in that you can capture villains and trap them using the correct elemental crystal. If you don’t have the correct crystal the villain’s put into the vault until you do. Once you’ve trapped your villain you are able to swap your Skylander character for the captured villain and use it in the battle for good. You do this by using a button on your controller, so long as the trapped villain is in its place in the portal. These villains have their own speaker in the portal so they talk to you and make some suggestions along the way. When you’re playing as the trapped villain you only get a certain amount of time before you’re swapped back to your Skylander character. This is handy when you’re battling a boss and you don’t want your Skylander to ‘go to sleep’ when it runs out of health. The other toys you use on the portal consist of the Skylanders and the Trap Masters. And of course you can use your old Skylanders from previous games. The only gotchya is that it’s only the new Trap Masters who can open the elemental gates in this game so you can’t use your previously purchased Skylanders to open the gates. You only get one Trap Master in the starter pack so if you want to see what’s behind the elemental gates you’ll need more of these Trap Masters. And that’s the downside of the game for me. After four years of buying extra figures I’m a bit over spending more money for more of these characters. However, there’s still lots of aspects to the game that you can play without forking over more money. Once you get used to the crystals, the Trap Masters and the Skylanders, the rest of the game is pretty familiar if you’ve played before and I like the sense of humour injected into the game from Flynn and the villains. Oh, and the villains have a chance to redeem themselves in side challenges. It’s certainly come a long way from playing Spyro in the earlier days of when my son first got a Playstation 2 (there is a Spyro Skylander). We saw JJ’s friend (nearly nine years old) the other evening and he was very excited to find out we have the new Skylanders and can’t wait to come around and play it. And out of all the games my son has, this suits me far better than some other games he plays on the Xbox. It’s something we can do together. We played this on the Xbox 360 but it’s also available on the other gaming consoles as well.